Our entire mortadella range is produced using only the most carefully selected meats, free from gluten, lactose and milk protein, and following traditional recipes to the letter. 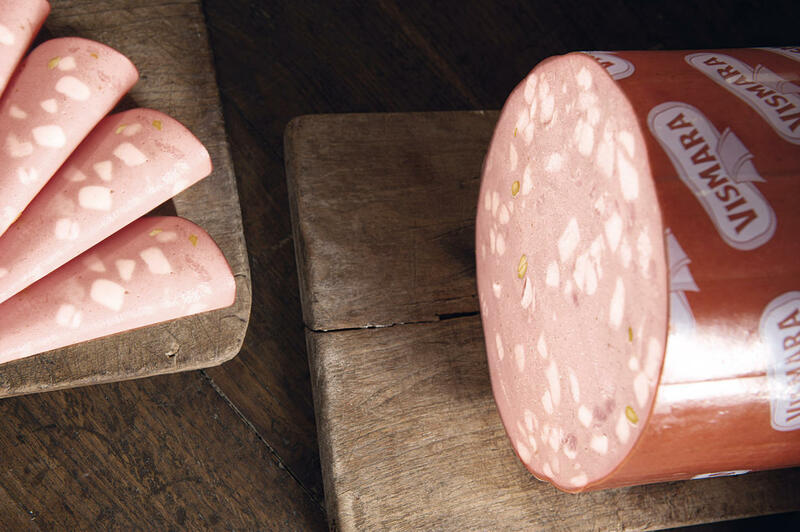 The subtle flavouring and long cooking time give our range of mortadella its characteristic fragrance and unique, delicate taste, ensuring it is truly unmistakeable. With a cured meat tradition stretching back to 1898, Vismara has a real wealth of knowledge in the production of mortadella. Top quality cuts of meat, perfectly balanced spices and a special recipe from Brianza are combined with the most cutting-edge production technology around to guarantee the quality that has become synonymous with the brand. Ferrarini’s Antica Rivalta mortadella is created following a top-secret recipe, whilst the special cooking method gives the meat its characteristic aroma and trademark softness. Discover how we produce our mortadella. Mortadella is a cold cut with a millenary history. It was probably produced in the 1st century and became widespread in the area between Emilia Romagna and Rome. The name comes from “mortarium” (mortar), the name of the tool used to grind the pork. Where can you find our Mortadella? Enter your details HERE: we will send you an email with a list of all your nearest retailers that stock our Mortadella. In the production of our cured meats, we use both animals born, reared and slaughtered in Italy and animals born, reared and slaughtered in other EU countries. The reason we use meat from other countries is partially the fact that Italy is not self-sufficient in terms of its pork production (we import around 40% of our pork), and more importantly the fact that almost all pork hind legs from pigs born, reared and slaughtered in Italy are used for the production of PDO aged hams (Parma, San Daniele etc). In the production of non-PDO cured meats, the source of the meat does not affect the quality or healthiness of the product. How long can the products be kept in the fridge after opening? Mortadella is a delicate cured meat and needs to be kept at a temperature of between 0°C and 4°C. We recommend that you consume it within one or two days of opening. Lardelli are little cubes of white fat obtained from the pig’s throat. They are used to bring out the flavour of the meat and give it added softness, keeping each slice compact. Mortadella is also rich in minerals such as iron and zinc. As a result, it is ideal for anyone who does a lot of physical exercise and thus needs a good supply of energy. Mortadella is low in cholesterol and has a limited salt content. The origins of the name ‘mortadella’ are still not entirely clear, though most research dates it back to Ancient Rome. Some trace the name back to the term “mortarium” (mortar), which is the tool used to flatten pork, whilst others believe that it comes from the term “mortarum”, a sausage flavoured with myrtle berries, or from “murtatum”, meat finely minced with a mortar.